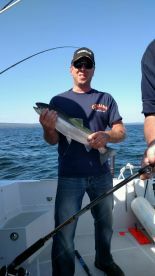 FishNorthMN specializes in guided trips out of Duluth, MN on the mighty Lake Superior and its surrounding tributaries. 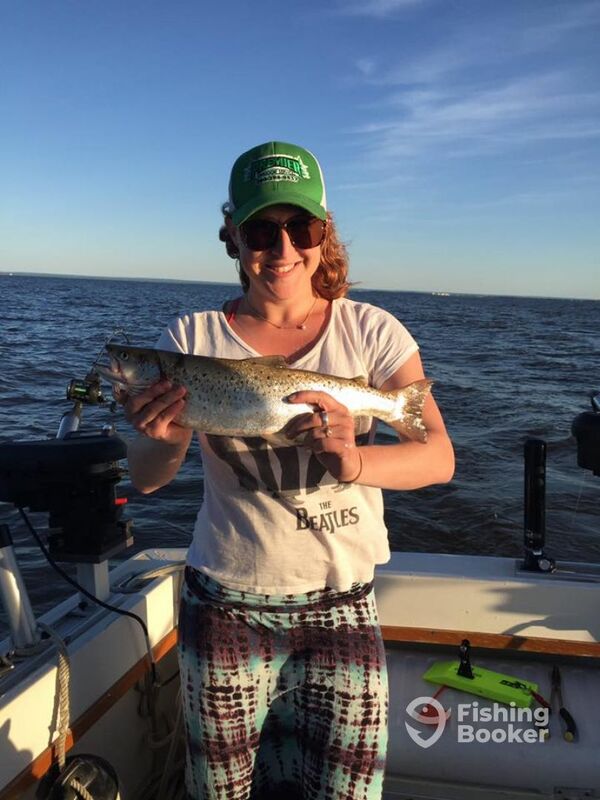 If your goal is to have a fishing trip of a lifetime, you have found the right place. Using tournament-proven methods and the finest gear and tackle by Okuma and Daiwa, you will be targeting the lake’s “superstars.” Those include Salmon, Brown Trout, Walleye, Lake Trout, and Steelhead. 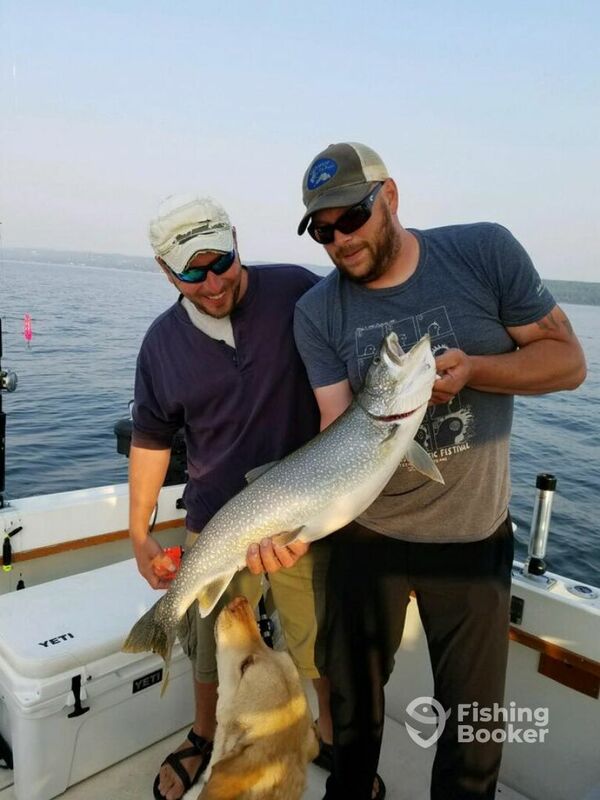 Your technique for the day will be anything from jigging and casting to trolling live bait and fly fishing. 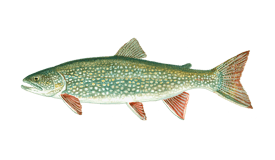 FishNorthMN will take you out aboard the ‘True North II’, a 33’ Chris Craft Amerisport. She is a spacious, seaworthy fishing machine with twin 350 HP Chevy engines and plenty of space for up to 6 anglers. 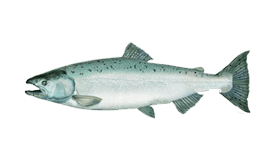 The True North is fitted with a Raymarine radar, along with Furuno fishfinder and a sound system. 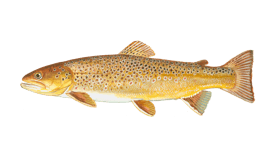 All trips come with rods, reels, tackle, bait, fly fishing equipment, lures, and catch cleaning. 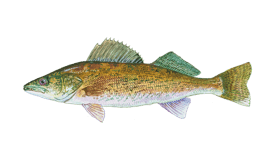 You will need to purchase your own fishing license and bring something to eat and drink. 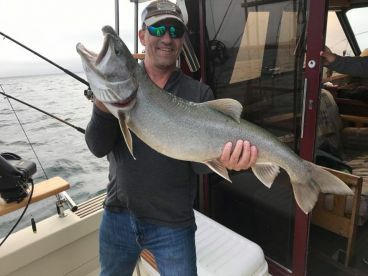 This is a full-day trip that is great for those die-hard anglers who are looking for a battle of a lifetime. 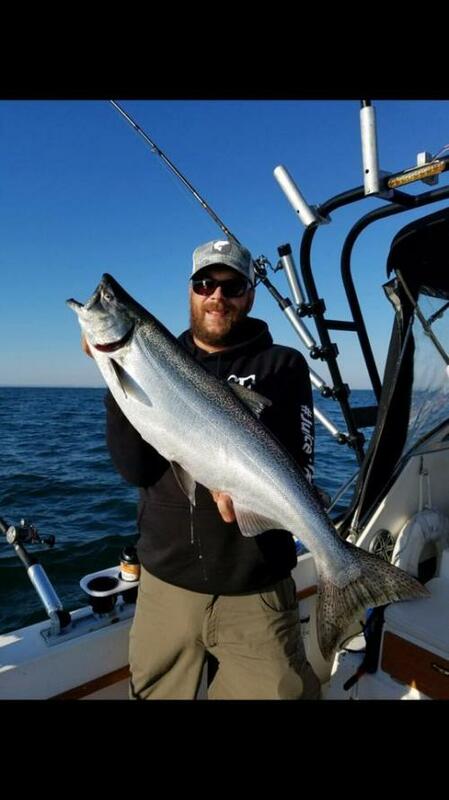 Your target will be Trout and Salmon on Lake Superior. 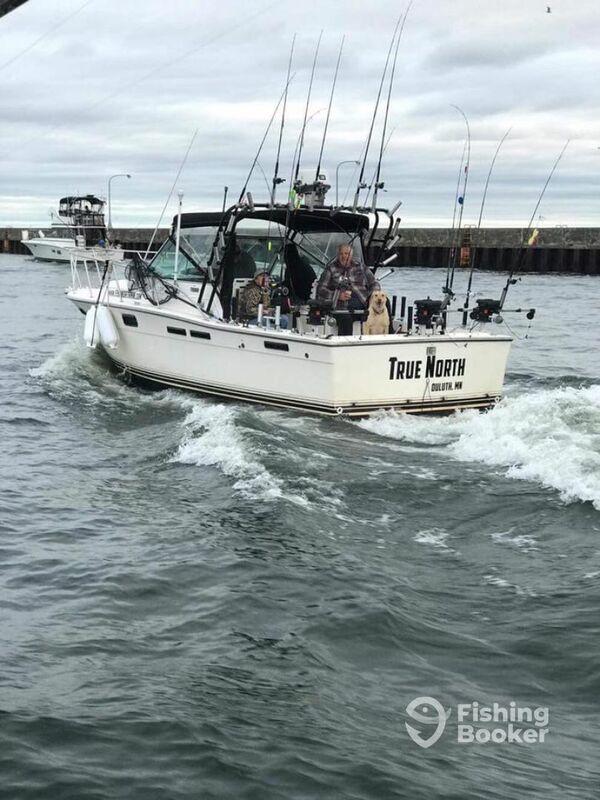 This is a 5-hour half-day of fishing aboard True North, our Tiara 2700 Open. 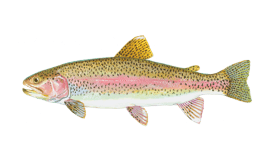 You will be targeting Trout and Salmon on Lake Superior and its tributaries. 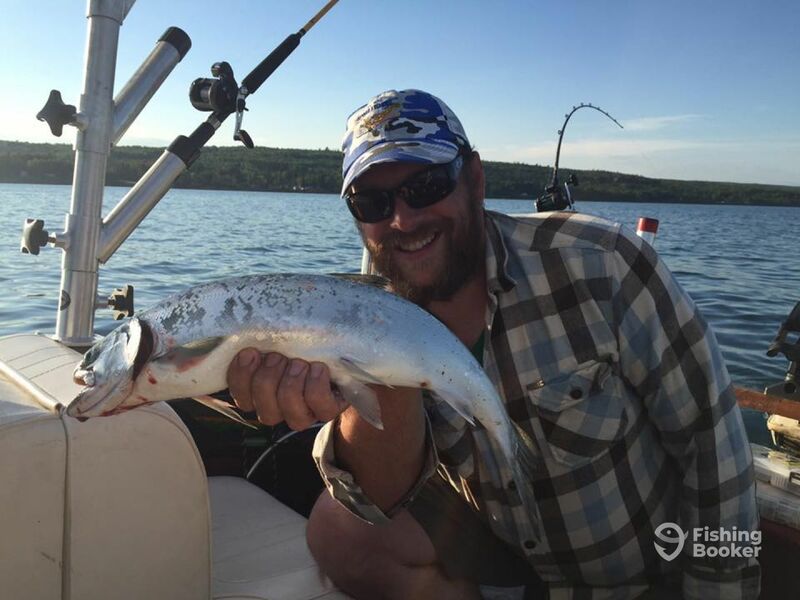 This is an afternoon trip that will take you fishing for various types of Trout and Salmon on Lake Superior. 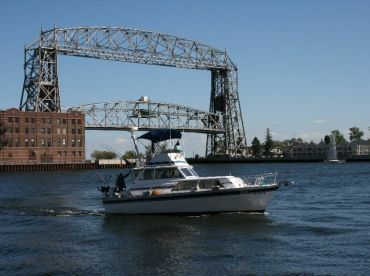 You will be heading out aboard a comfortable boat with plenty of space and shade. Chris Craft (Offshore sport fishing) originally built in 1987. Powered by 2 350HP 454 Chevy engines, with a maximum cruising speed of 35 knots. 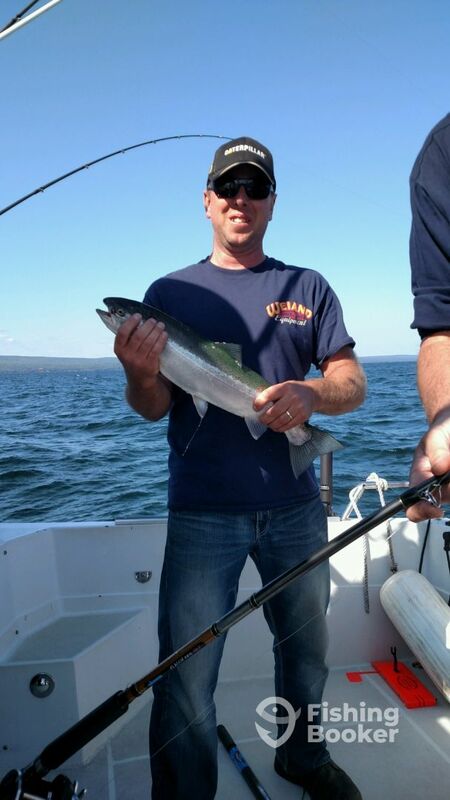 Kent has been fishing Lake Superior and the surrounding area since 2002. 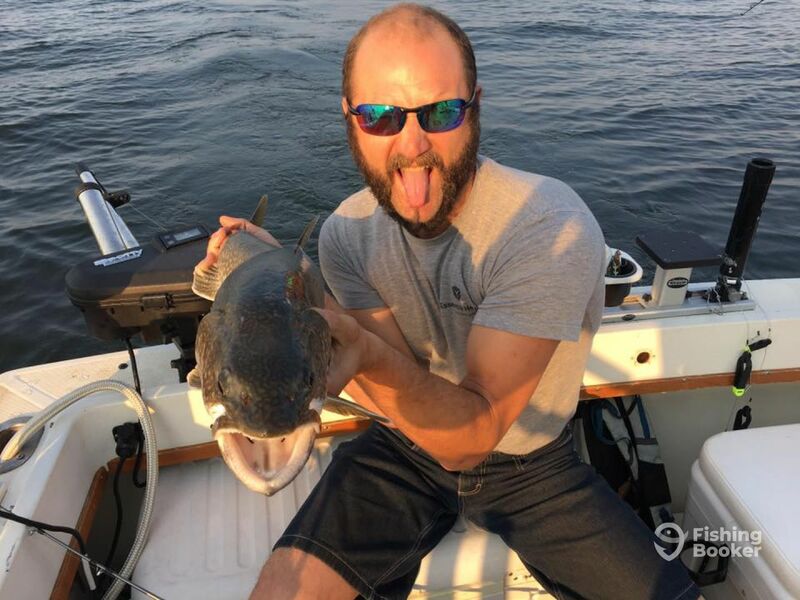 He has worked for years as a first mate for some of the most respected captains in the area. 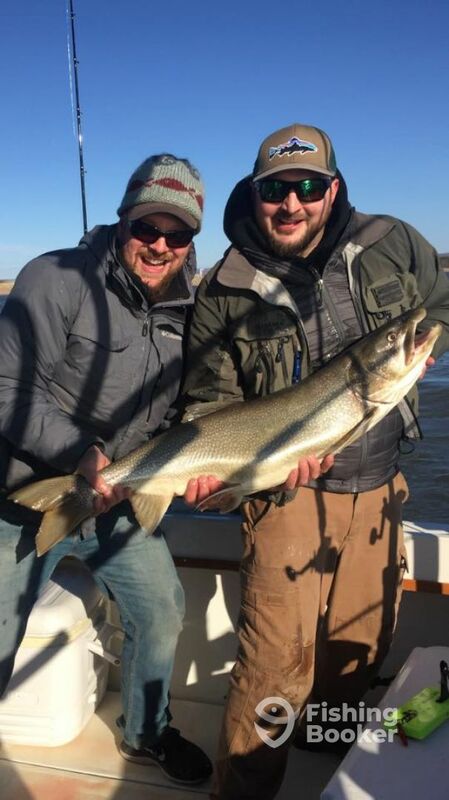 He got his captains license and started FishNorthMN with Captain Jordan Korzenowski in 2016. Kent is very passionate about learning new techniques and spots to become the most efficient and productive captain possible. 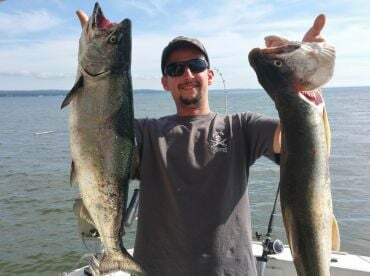 He works with a large network of fellow guides and fisherman to make sure he stays on the hottest bite at all times. 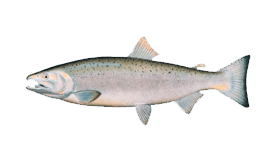 When not running charters he is most often exploring new waters or creating new spoons and flies at his shop. 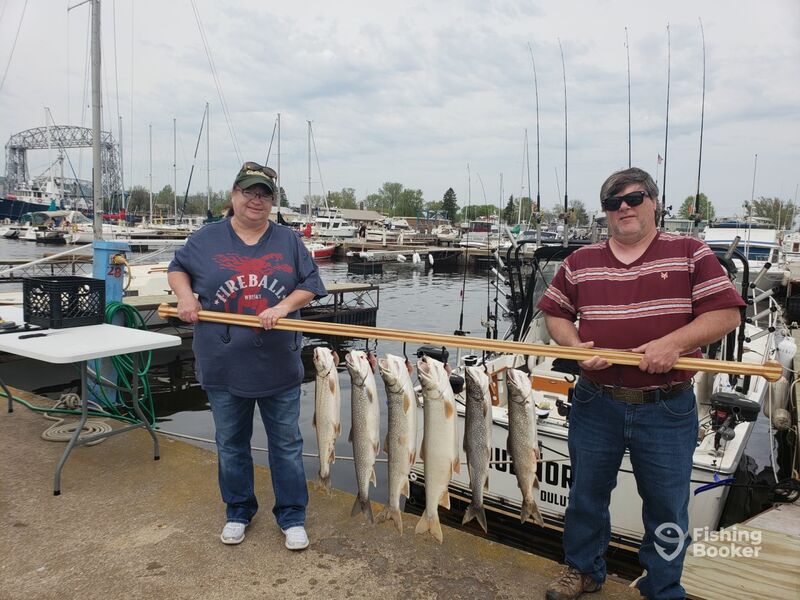 We had a great time fishing with Jordan and Kent. 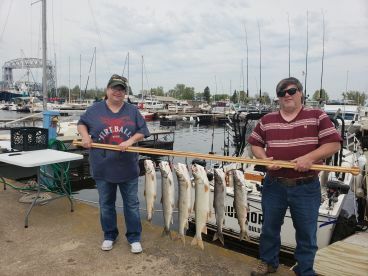 We caught several large Lake Trout and a couple Walleye. Our group consisted of myself, my fiance, and our four children ages 9, 10, 11, and 12. 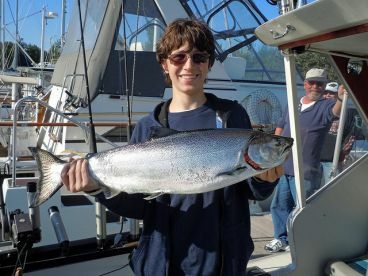 The kids will not stop talking about their fishing experience, they loved it. Kent and Jordan were friendly and helpful. 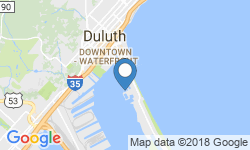 I would recommend anyone with kids or without to book a trip with these guys! Thanks Jessica! Hope to have your family on board in the future! 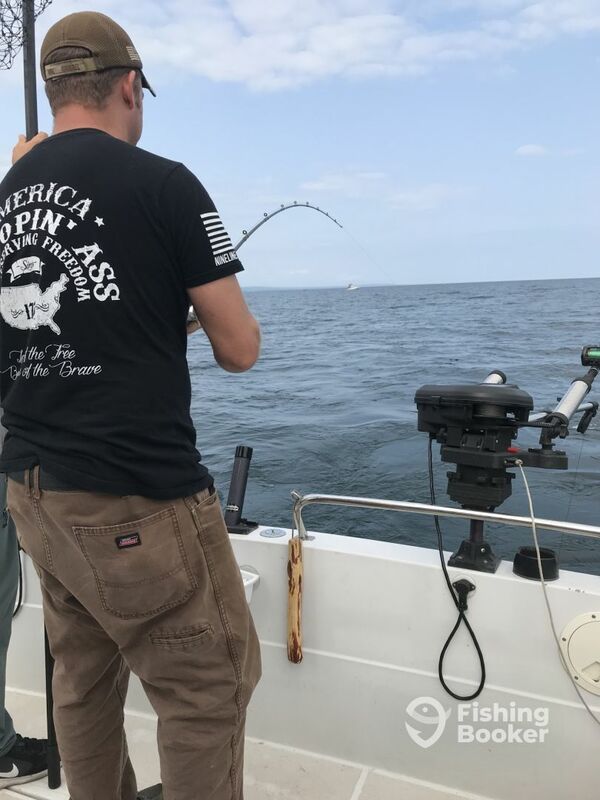 Entire fleet had in the area was having a tough afternoon but Kent our captain kept with it and even kept us out a little longer to make sure we got a few extra fish. These guys are great! I’ll use them again for sure! Thanks guys, it was a pleasure having you on board! Great experience. We will do another trip this fall. Thanks guys! We look forward to seeing you again in the future!